CHILDLINE 1098 is a national, 24 hour, toll free, emergency outreach service for children in need of care & protection. Any child or concerned adult can dial 1098 to avail of emergency assistance. >>Unique Govt. – NGO – Corporate partnership. >>Largest child help line in India. >>A link between Govt. of India and Civil Societies. CHILDLINE India is a project of Ministry of Women and Child Development. Childline India foundation is a non-government organisation (NGO) in India that operates a telephone helpline called Childline, for children in distress. It was India's first 24-hour; tollfree, phone outreach service for children Childline was first established as an experimental project in June 1996, by Jeroo Billimoria, a professor at the Tata Institute of Social Sciences (TISS), Mumbai at the department of Family and Child Welfare. Subsequently, Government of India, established the Childline across India in 1998-99, under Ministry of Women and Child Development, as an umbrella organisation to support and monitor services across India, while also serving as link between the ministry and various NGOs working the field. The Secretary of the Ministry functions as the Chairperson of the Governing Board of the Foundation. >>Inaugurated By: Sri Mridul Kumar Mahanta, Ex-Deputy Commissioner Karbi Anglong, Assam. >>Jirsong Asong was formed on the 4th December 1985 under the able leadership of Rt. Rev Mathai Kochuparampil, Bishop of Diphu. 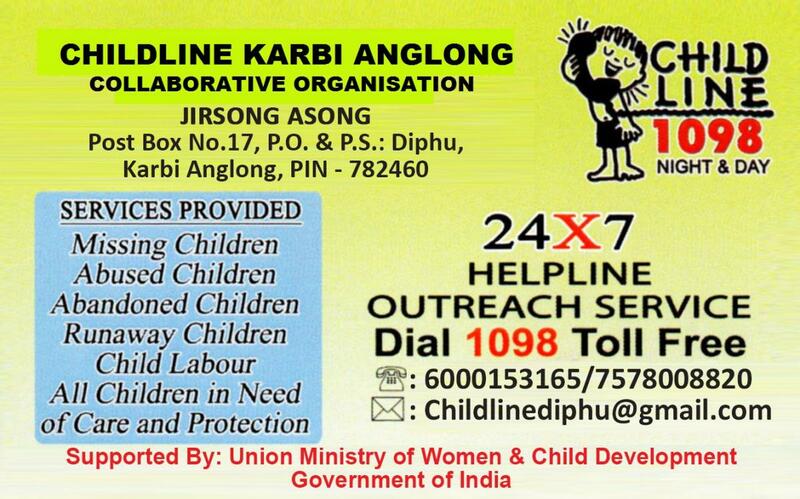 Social Service Wing of Diocese of Diphu in Karbi Anglong district of Assam. >>Jirsong Asong means an ‘Association of friends’ in the Karbi language. >>Present Director: Rev. Dr Tomy Palely, Asst. Director: Fr. Saji Lukose. >>Child provided rehabilitation, follow up with child long term linkages grass roots outreach and open house.